Yes, they are both pros. It even says so in their names. On one hand you have the Microsoft Surface Pro, and on the other hand you have the Apple iPad Pro. Both are high-end detachable tablets that are at the top of the sales charts. According to analytical firm Canalys, it is the Microsoft slate that was been preferred by the enterprise in the U.K. during the first quarter of the year. From January through March, U.K. businesses snatched up 275,000 units of the Surface Pro which more than tripled the previous year's Q1 sales of 83,000 slates. The Apple iPad Pro sold less than half as many units to the U.K. enterprise in the quarter, with 107,000 iPad Pro tablets purchased by U.K. firms. If you're wondering about the U.K. consumer market, it is a different story altogether. There, the iPad Pro is outselling the Surface Pro. So what is the difference in the enterprise? It's actually quite elementary, according to Canalys senior analyst Tim Coulling. "One of the problems facing Apple is price, the other is familiarity and applications," Coulling said. He is referring to the many Windows powered computers that are used in the business world. Those working for corporations and businesses are more familiar navigating around the Surface Pro than the iPad Pro. The tablet market in the region is just as weak as in the rest of the world. Overall, consumer purchases of tablets declined in the U.K. by 8% year-over-year from January through March. The iPad was the top selling tablet in the U.K. during that period with 500,000 units sold. Samsung was next with the manufacturer moving 333,800 units. Both figures are down double-digits in percentage terms from the year earlier numbers. Agreed. Personally, I think they should have simply kept the "Air" moniker rather than subjecting themselves to media scrutiny with a Pro device. One could argue the iPad Pro could be used by artists as a professional tool, but even that is a stretch honestly. The MacBook series is far better for video and music editing. True, or they could call it iPad Plus or something like that, just not Pro. "Plus" was my first assumptions as well when the rumors began to circulate. iOS just isn't "sophisticated" enough to warrant such a hefty price tag in any business setting. The Ipad Pro is just a nice media consumption device for most of the people who bought it. Agreed. Its not so much the hardware as it is the software. As long as apple denies a true file share system that can manually be maintained ON THE DEVICE (no cloud crap) it cant be considered truly "pro". Best for media consumption? The only pro is the high res display. 4:3 aspect Meh. No Front Facing Speakers Meh. ipads are given way more credit than they deserve. Its iOS after all. App situation is on par with iOS sans the exclusives. Windows FTW. I own the iPad Pro 12 inch, and despite not having front facing speakers, the quad speakers and their alignment are just fine. Yeah but the position itself isn't the best. I didn't mean that they're bad but reviewers give too much credit for the product.
" for the price you can get Macbook which destroys both SP and Pro in everything" Only if you're comparing an upper-class MacBook to the Surface, otherwise, the Surface Pro performs on par with the equivalent MacBook Air (http://www.dereferer.org/?http%3A%2F%2Fbit%2Ely%2F1y0BAaV ), if not better, and definitely destroys the overpriced new 12" MacBook desperately trying to compete with it in portability yet failing miserably in terms of both performance and versatility. The Surface Book no doubt performs better than the equivalent spec 13" MacBook Pro ( http://goo.gl/9HJ2If , http://goo.gl/ew8D40 , http://goo.gl/c1arOx )...don't even go into that price BS, 'cause all of apple's devices are 1/3rd as versatile as any Surface equivalent. Why would you purchase it after its released when you can wait till the price goes down. And then it would be cheaper. The Macbook doesnt destroy the Sp4 in everything. if you actually think that, than you really need to go and look at the facts. The SP4 is faster tahn the Air and its faster than an entry level Macbook. The i7 configure SP4 will give the Macbook a good run, accept in application that may need a dedicated GPU option. Hwoever if you configure a Macbook with an Intel GPU, it isnt going to be any faster than the SPy. The Surface Book is also 20% faster than the Macbook 15 when configured with an i7. READ -http://www.gizmag.com/new-macbook-vs-surface-pro-4-comparison/40029/ http://www.pcworld.com/article/2995599/laptop-computers/surface-book-vs-macbook-pro-it-isnt-twice-as-fast-its-three-times-as-fast.html http://www.wired.com/2015/11/how-to-get-windows-10-update/ The SP4 is 50% faster than the Air. Its 20% faster than the Macbook 15 based on a comparisble configureation and its also faster than the Macbook 13.3 with a similar configuration. Dude you ahve no idea what you are talkign about. For a battle with the Macbook 15, you shoudl even compare it too a Surface pro 4. That si where the Surface Book comes in and is a fair comparison and it is not faster. The Surface Book liek the SPy comes with a Pen. It has almost 13hours of battery life on a single charge even using the dedicated GPU, it has a Touchscreen. Show me a Mac with a Touchscreen. How exactly si the Macbook better than a Windows PC? That's right NONE OF THE MACS ARE BETTER THAN ANY WINDOWS PC...PERIOD They are not better in performance, Mac are terrible at running Windows and they are way overpriced for what you get. To be fair the Surface Book is overpriced too. But with Surface pro 4 I get performance that si better than the Mac Air and the entry level 13" Macbook. You are so foolish. No Apple computer on this planet has ever been better than any Windows PC. EVER! i have used both, not latest gen but still. i own macbook pro, which i get for free as present. i would never understand the ones who buy tablet with phone os for same price as most 13` laptops, just so i could watch youtube on more portable device, since it cant do more i guess. Of course, the surface is a hybrid device with a desktop OS so no tablet stands a chance when it comes to productivity. iOS (mobile) and Android although capable don't hold a candle to Windows 10. MIcrosoft store is still s**t though. LOL! IPAD = TOY Surface = Also a Toy Possible reason? A. Even if the surface pro uses intel HD, You could still play old games that are still good. B. You can watch movies, porns, comics, which is the same as the ipad. Still Here's the fact: - Apps that are built for ipad are full touch capability. Unlike surface pro 4 which have less touch based apps. And more on desktop apps. - Entertainment is where ipad is good at. Capable of docking on a lightning port speakers. Compared to surface which depends on bluetooth or an audio jack. - Ipads pricing can easily go down every year. Meanwhile, surface pro 4's pricing slowly goes down. But still remain in the $700 and above. - There are a lot of accessories which the ipad has such as the lightning port speakers, Keyboards with backlit, which is a good accessories than what surface pro offers. - Fact that apple store is located all over the world means you can go to the nearest apple store if there's a problem with your unit. Meanwhile there's hardly any microsoft stores located all over the world. And if you find your unit behaving badly while on a business trip. You have to find a computer technician or a tablet specialist to repair it. A real WORK goes to Laptops! NOT TABLETS YOU MORON! Apps for the iPad shouldn't even be compared to Windows Apps. Even though many x86 apps are not designed for touch, it still works. Only a complete knucklehead would compare a .99 app to a full blow desktop application. 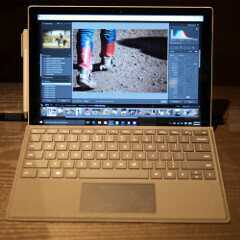 The Surface can handle any an all media formats while the iPad is stuck with using less than 10. With Windows I can support any video or audio format. What accessories do I need is a carry case. What accessories do the iPad have that I can get for the Surface? How about this, the Surface some with a Pen. NEVER NEEDS CHARGING. Oh and the pen doesn't cost $99 for the Surface ether and it does more than the Apple Pencil. Oh and the Surface Pen has an eraser. All that BS about Apple Stores and blah blah blah, doesn't really apply here. I live in the USA, it doesn't matter about anywhere else. Plenty of MS stores here. Their are 6 MS stores with 30 mins of where I live. Funny, there are 6 Apple's stores within 30 mins of where I live. So what advantage is that exactly? I am sure there are more Apple stores in NY than there are in China. Dude...you can like Apple, but stop comparing frivolous BS. Is that it? A pen! Hahahahaha! Now let's compared that to accessories offered by Apple and third party accessory providers. - lightning port speakers which can both charge your iPad or iPhone, and at the same time functions as a speaker which can play music or video. Does your sp4 have these? - Different smart connector keyboards with backlit functions. Do you have more than 1 keyboard providers all over the world than USA? - If having a keyboard isn't your style. You could get a shockproof, and waterproof cases. Does your sp4 Accessory providers have these? Comparing frivolous bs? I said facts that are relevant. You think that just because it's a tablet version of Windows means it doesn't differ from having a desktop version which are both using a .exe file. What's the difference from having a tablet and a laptop if both are using the same Windows, apps, and even capabilities other than touchscreen, and pen? I call my tablet a wankpad. Self explanatory. i remember few years ago i was so interested to try mac osx, now it has been 3 years i own macbook pro i guess is very same while others do innovate things. Apple don't innovate, they just go shopping every year and acquire companies for useful technology then can use in new devices and then rename it and claim they created it. Thank you for this. I swear the Apple haters here are completely devoid of the ability to actually do research :D. That's right gentleman..... GOOGLE BOUGHT ANDROID (#19 acquisition)!!! They didn't create the OS, they purchased the company responsible. It's the same thing you accuse Apple of, but at least Apple developed it's OS lol. I'm actually pretty shocked at the sheer number of acquisitions Google has made compared to Apple. Almost 3 times as many :D..... that's pretty funny. By the number of acquisitions that might be true, but I feel that Google increases R&D when they buy a company and use the acquisition to increase innovation. They often provide the tech and patents to all of their partners as well, and this benefits the whole industry. Apple on the other hand seems to buy companies and use their technology but cease new development and patent everything related so that the industry as a whole can't build on it. I never like the Apple way of doing business, it might be ideal for them but as a customer it doesn't benefit me when anyone stifles competition. It's not like Android was bought and released the following year with a few tweaks, it took a few years of development before they bought it to market and has changed massively since then. I was referring more to hardware innovations than software anyway. Plus Apple restrict users too much. Apple *doesn't* innovate. The rest of your post doesn't really matter in the long run. People don't buy Apple products because they "innovated" them, they buy them because they are reliable. Case in point: iPad Pro vs Surface Pro sales figures and support relations. Guess who has a better standing in both ;D.